Somali-American Ilhan Omar campaigning in Minnesota (file photo). 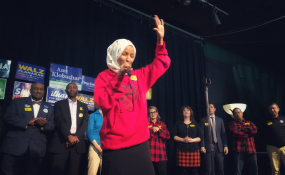 A Somali-American woman who lived briefly as a refugee at the Dadaab Refugee Camp in Garissa County has been elected to Congress in America's midterm elections. Ilhan Omar, who has spoken openly about her time as a refugee in Kenya, was elected as the first Muslim woman to represent the State of Minnesota in Congress in Tuesday's election. "I stand here before you tonight as your congresswoman-elect. With many firsts behind my name. The first woman of colour to represent our State in congress. The first woman to wear a hijab. The first refugee ever elected to Congress. And one of the first Muslim women elected to Congress," she declared to a cheering crowd in her victory speech. In an interview with Elle magazine in September this year, Ms Omar opened up about her Somalia background and shared what it was like to arrive in the US for the first time as a child of 10. "At the time, I was in middle school, and it was really rough for me. I didn't speak English. I was dealing with being an extreme 'other' for the first time. I'm Muslim and Black and was coming from a Muslim-majority country where everyone was Black," she said. Congresswoman Karen Bass, projected to win a fifth term in Tuesday's US midterm elections, has visited Kenya twice in recent years. The 65-year-old Democrat, who represents a Los Angeles district, travelled with Barack Obama on his first presidential trip to his father's homeland in 2015. Ms Bass was also co-leader of a National Democratic Institute team that monitored Kenya's August 2017 presidential election. She praised what initially appeared to be a peaceful, credible exercise in democratic decision- making, saluting the large numbers of Kenyans who waited patiently to cast their ballots. Her expected takeover of the top post of the House's Africa panel will probably not result, however, in major shifts in US policy. Congressman Chris Smith, the Republican who has headed the Africa subcommittee, opposed President Donals Trump's efforts to slash spending on US aid to Africa. "The President proposes; Congress disposes," Mr Smith told a Trump administration official at a subcommittee hearing last year. "Congress will make sure we get humanitarian assistance to where we need it most." Mr Smith has taken a keen interest in African affairs, regularly convening hearings on conflicts and policy initiatives. His approach reflects a long-standing Republican-Democratic congressional consensus on Africa issues that has not been eroded by Mr Trump's indifference or occasional belligerence toward the continent. But Ms Bass might adopt a more confrontational tone in her subcommittee's dealings with Mr Trump's Africa team. At a subcommittee hearing last year, she lamented the policy positions that two veteran State Department diplomats had been required to present as representatives of the Trump administration.